While it seems to be the preferred method of TV-watching the world over, 'binge-watching' is a relatively new concept. Entire seasons of television series now at our fingertips, plus a generation with a need for instant gratification, are two factors which perfectly explain this phenomena. Streaming services such as Netflix, Amazon Prime and Hulu have caught on in Egypt and even started releasing their own original series with every episode of a season available immediately – and we all know that no one actually attempts to pace themselves and watch an episode weekly, or even daily. It’s all or nothing. 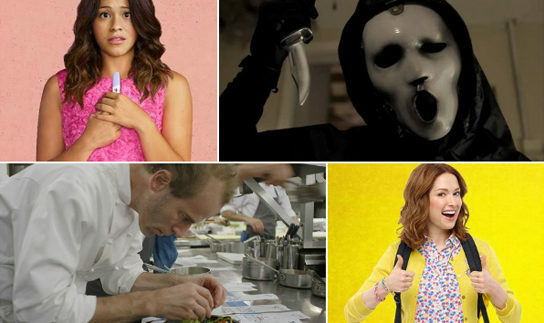 If you love slasher films, then it won’t be difficult to watch just about every episode of this show in less than 24 hours. This spinoff features all the same components of the beloved 1996 classic; the creepy phone calls, the high school drama and the blood and gore, but they are now integrated into the ‘selfie generation’. The fact that the killer and all the potential victims have access to social media definitely makes the situation a bit more intense. In the very first episode, Noah, the know-it-all horror nerd, explains to his class why a slasher movie cannot be made into a show. They ‘burn bright and fast’ and therefore cannot be stretched out over a series of episodes. Hearing this and then wondering how the writers will take this classic genre and turn it into a show is enough to get anyone hooked. If you haven’t heard about this show, you’ve probably been living under a rock. This comedic drama gives a look into the lives of women in prison and provides a very important, yet difficult to stomach, social commentary on corruption in the American justice system. Perhaps the most loved thing about this show is the representation of women as real, complex characters from all different backgrounds. The much anticipated fourth season goes all out with much more intense storylines surrounding police brutality and mental health, but dark as the new season is, it still maintains the show’s well-loved humour and hilarious moments of comic relief. Warning: make sure you have a box of tissues and a supportive friend with you as you binge on this season. Tina Fey’s newest comedy is nothing short of adorable and addictive. This show centres on Kimmy Schmidt, a woman who has been kept in an underground bunker for 15 years by a controlling cult-leader. Sounds dark, we know, but watching Kimmy as she discovers and navigates the world after her release with the help of her hilarious and sassy new roommate makes it impossible to not fall in love with this show. Besides being hilarious, it offers quite a lot of commentary on social issues such as race and gender, all delivered through extremely witty humour. Besides making you laugh, this show will certainly get you thinking. This satirical rom-com parodies typical clichés and tropes used in telenovas (Spanish soap operas) making it dramatic and very funny all at once. When Jane, a religious young Latina woman, is accidentally artificially inseminated during a visit to her doctor, she has to deal with the sequence of events following her being a pregnant virgin. With a main character as relatable, goofy, and wonderfully human as Jane, the first episode alone will leave you wanting more. If you are a fan of shows like Vampire Diaries or Supernatural, then you may want to give this one a try. Based on the book series, The Mortal Instruments, by Cassandra Clare, Shadowhunters takes place in modern day NYC and stars 18 year-old Clary Fray, who discovers that she is part of a breed of human-angel hybrids destined to hunt demons. With ridiculously good-looking main characters, extravagant action sequences and wild fantasy creatures, who could resist? The new brain-child of Judd Apatow, Paul Rust and Leslie Afrin includes all the typical ingredients for a classic rom-com: guy and gal in their early 30s, both fresh out of turbulent relationships, dealing with the everyday struggles of life. However, this show takes a much deeper look into the human experience through its sometimes dark humour. The dialogue is so quirky yet natural it’s almost off-putting. With its vulgar yet realistic and relatable content, this show is definitely unique (and NSFW). This is by no means a newly released show, but whether you’re an old-time fan or completely oblivious to the wonders of it, everyone is getting excited about the Gilmore Girls reunion season which will be out later this year. The new season will give viewers a look at Rory’s present-day life and, hopefully, sort out any leftover questions (yep, Dean, Jess and Logan will all be making appearances). Until then, it is necessary to binge-watch all seven seasons of the show in preparation for the new season. Luckily for us, every country where Netflix is available will be streaming Gilmore Girls starting on the 1st of July. Prepare for a long visit to Stars Hollow. This critically acclaimed docu-series is every foodie’s dream. Chef’s Table focuses each episode on the work and creations of renowned chefs around the world. With beautiful cinematography and stunning visuals of innovative food creations, this is a pleasure to watch. Not only does the series focus on the chefs’ interesting cooking styles and restaurants, but also on their philosophies surrounding food as a whole. It is no understatement that this show could be considered a form of art. This crime thriller chronicles the life of Pablo Escobar, infamous Colombian drug lord and head of the Medellín cartel starting in the late 1970s. With a great deal of emphasis on corruption and violence, it won’t be difficult to get immediately drawn into the compelling plot. According to Patrick Smith of the Daily Telegraph, “this is drama that commands your utmost attention.” The new season is said to be released in August, so now may be a good time to start binging. With new superhero blockbusters being released left and right, along with plenty of new comic-book TV series, superheroes are all the rage right now. Marvel’s Jessica Jones is unique in that it has a somewhat film noir vibe. Jones is a former superhero who now works as a private investigator at her own detective agency where she deals with cases usually involving individuals with special abilities. On top of this, she has to battle her own personal demons and her PTSD. The show tackles much darker themes than most of the more wholesome, family-friendly superhero shows and movies which are so popular at the moment. If you enjoy psychological thrillers but are also a fan of superheroes, this might just be the show for you.